Part I covered Rose Dewitt Bukater, Ellen Arden, Vivian Rutledge and Frances Stevens. In this installment we’ll again be looking at one modern character and three classics. Keep an eye out for Part III and Part IV, coming soon! Big Fish is in general a very aesthetically pleasing film, filled with stunning colors and very well-executed special effects. But even with all of those bells and whistles, one of the most striking visual features is the wardrobe of Alison Lohman as young Sandra Bloom. Her outfits are just beautiful. Most are in a very structured ’50s style, though a few are more relaxed and free-spirited. Classic color combinations (such as the patriotic combo of a blue skirt with the red and white top) and lovely pastel shades complement the character’s sophisticated, prim and proper but youthful aura. Betty Lou’s wardrobe is just plain fun, perfectly matched to the character’s spunky personality. Even the somewhat plain clothes that she wears to work have fun details added, such as the silver detailing on her shoes. In fact, most of her clothes aren’t actually extravagant. Solids or classic patterns are all that we see her in. But it’s how they’re styled that makes her stand out. Betty Lou accessorizes with everything from a scarf worn as a headband to a small bushel of grapes attached to a hat. Such a hat would be pretty difficult to pull off in our own lives, but the viewer can’t help being inspired by her sense of fun nonetheless. Her clothes don’t always match, but the outfits work because they suit her as a character. 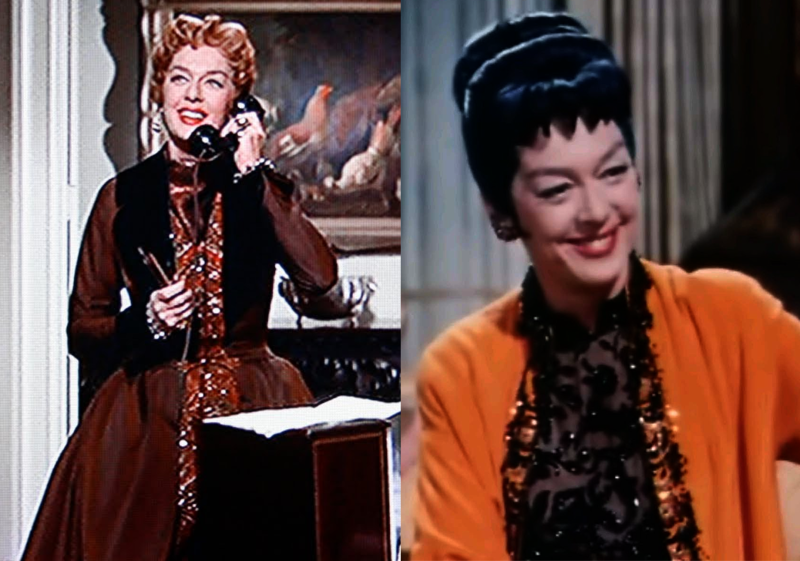 Rosalind Russell’s wardrobe as Auntie Mame is just as over-the-top crazy as the film itself. Ranging from ultra-bright shades to deeper, richer varieties and from lace detailing to brilliant jewels, these outfits are just completely extravagant. While we may not want to look to Mame for inspiration in our day-to-day clothing choices, her style is certainly one of the most eye-catching I’ve ever seen. Auntie Mame is charismatic, crazy and fun — all characteristics that are reflected in her wardrobe, and all characteristics that make her so lovable to the viewer. Melanie’s wardrobe can be described in three words: smart, simple and sophisticated. Consisting of tailored pieces in solid colors, Melanie’s outfits certainly don’t favor the flashier side of fashion. Accessories are minimal and the pieces that she wears always match perfectly. She always looks extremely classy and put-together. 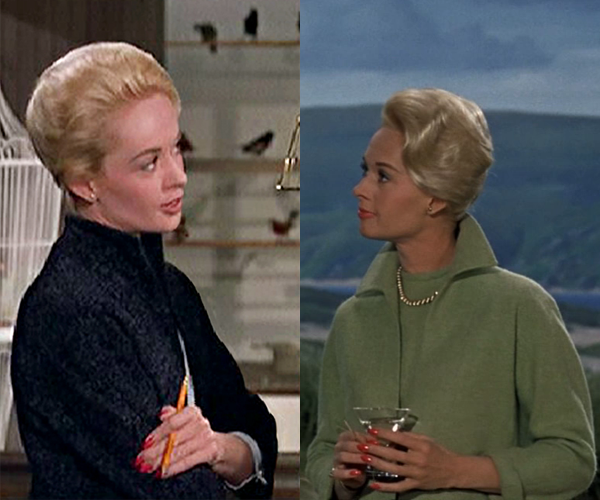 Unfortunately, such a smart wardrobe couldn’t save her from being attacked by a swarm of ferocious birds. Click on the images for full size, and as always, share your opinions in the comments! I hate to admit it, but out of these, I’ve only seen Auntie Mame (though the other three are on my to-watch list). I can’t imagine anyone really dressing like Mame does, but her wardrobe is certainly something to be seen! I hope you get the chance to watch them all! Definitely curious to see which other Roz characters you choose!